One of our favourite white washed towns, this fortified stronghold situated high on a ridge is located between Ronda and Jerez. As you can imagine from its topography, it has witnessed quite a few battles. You’ll enjoy a day here and can use it as a starting point to explore many more of the white-washed villages. There are plenty of ceramic stores to explore and a castle, churches, palaces and convents to visit. As always, the Parador is a good place to stop and have a drink. It’s a busy place at fiestas – during Easter week and for its Feria de San Miguel at the end of September when its horse and human population soars. Distance: 1hr 20mins drive from Seville; 43 mins drive from Cadiz; 30 mins from Jerez. 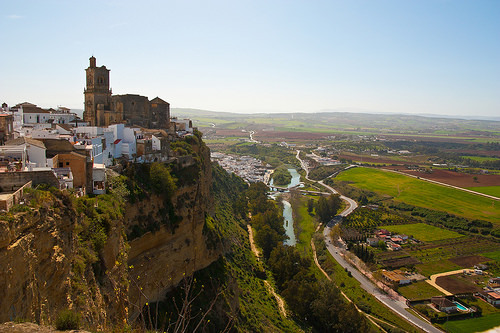 We’ve included Arcos de la Frontera in our Guide to Unusual Andalusia which you can read here. One of 14 protected villages located inside the Sierra of the same name, this village is popular with hikers and nature lovers who want to explore the many trails – some of which require written permission for access. You don’t need anybody’s permission to come to Grazalema itself – just enough time and energy to soak up the charm and colour. The village was recently given the title of one of Spain’s prettiest villages. You’ll find three small museums but really, you’ll want to sit and enjoy the stunning views. Bear in mind that this area is the wettest part of Andalusia – no need to panic – it’s not v wet – but it’s also 812m above sea level so pack a jacket in case it’s damp or chilly when you get there. 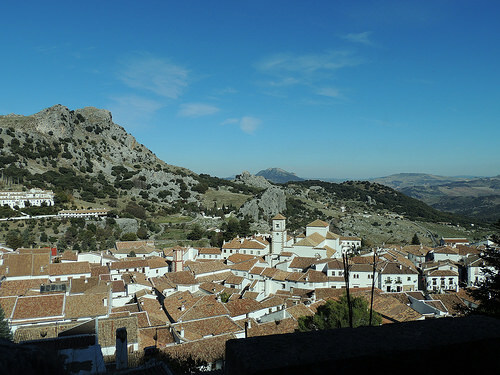 We’ve included Grazalema in Short Roadtrips in Spain to Charming Villages and Towns. Distance: 1hr 50 from Seville; 2 hrs from Malaga. 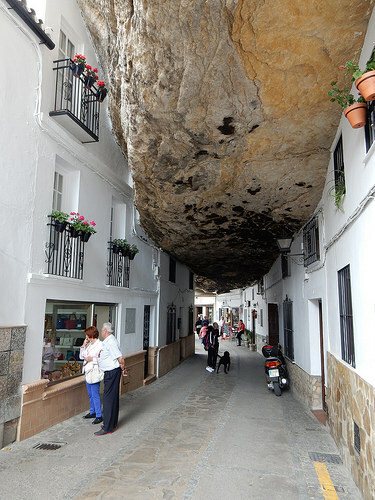 The medieval white washed village of Setenil looks like it’s being swallowed up by the rocks but nothing unusual is taking place here – just architecture that embraces the caves and topography quite literally. It’s interesting to walk around the streets and see this geological interaction but don’t forget this is a living place – with all the usual fiestas and traditions too. Ask for the walking route of Ferdinand & Isabella – the Catholic Kings who were in town back in 1484 and yes, you can visit some of the sights they took in! We’ve included Setenil as one of Spain’s white washed villages in our guide to 25 Images that Define Spain. Distance: 1hr 45 from Seville; 30 mins from Ronda; 1hr 20 mins drive to Malaga. 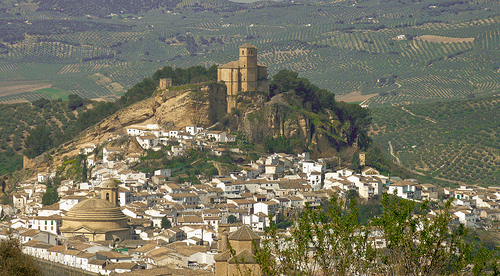 While Ronda is certainly not a village, it’s well-worth visiting while touring Andalusia’s white-washed towns. It’s famous for its connections with Hemingway, its taurine traditions and also its bridge. 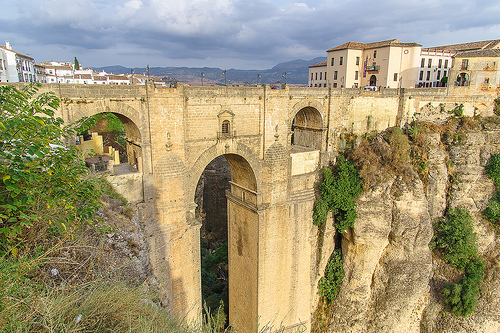 The Puente Nuevo is the newest and largest of three bridges that span the 120-metre-deep chasm that contains the Guadalevín River and divides the city of Ronda. Don’t let the word ‘nuevo’ fool you. It’s been here since 1793. Right beside the bridge you’ll find what was the town hall and is now a Parador – the views from the outdoor terrace are amazing! Whether you agree with bullfighting or not, the bullring is another major landmark that’s hard to miss – you can visit the museum. Leave time for the medina which is where you’ll find the Arab baths. You can read more about Ronda in our Guide to the Best Hotels with Views in Spain. Distance: 1hr 45 drive from Seville; 1hr 25 from Malaga; 2hr 10 mins from Granada. Standing at 246m above the sea between the Ronda mountains, the Costa del Sol and Gibraltar, Casares’ origins are attributed to Julius Caesar who it’s said ordered its construction as an act of gratitude for being healed by the hot springs of La Hedionda. You can still enjoy the hot springs as well as the ruins of an Arab castle, the 17th century church; the 16th century convent and the caves of Ballesteros. Distance: 40 mins from Marbella; 1hr40 from Cadiz; 1hr 30 from Ronda. Like Ronda, you certainly can’t call Antequera a village but it is a gleaming white gem and very very charming. Located at 575 m above sea level, you can explore the old Alcazaba fortress, the Arch of the Giants – the 16th century entrance to the castle gardens, the 33 churches including that of Santa María la Mayor which dates back to 1514 and the many Baroque monuments. Outside the town you also have the recently listed UNESCO dolmens which were collective tombs dating from 2500 AC – and the also listed curious Lovers Rock in the shape of a person – which is the focus point for the underground passage of the dolmens as well as El Torcal mountain. You can read more about the UNESCO listing here. Distance: 1hr 15 from Ronda; 48 mins from Malaga; 2 hrs from Seville; 1hr 10 from Granada. A sub-tropical climate welcomes you to Frigiliana located at an elevation of 320m inside the Sierras de Almijara Natural Park. The Festival 3 Culturas has brought fame to the town which is a member of the network of the prettiest villages in Spain. The Easter processions are very special here. If you visit on the 3rd May, you’ll find the town decorated with floral crosses for El Dia de la Cruz. Keep an eye out for the Sugar Cane Factory – El Ingenio. 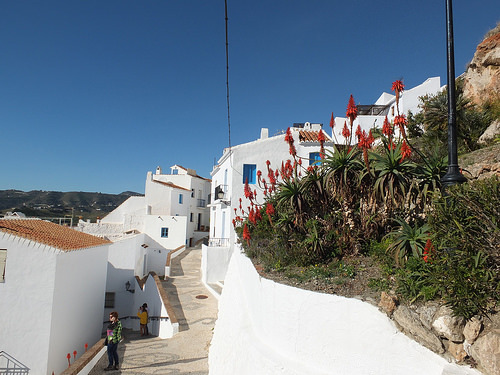 We also included Frigiliana in our Guide to Short Roadtrips in Spain. Distance: Nerja 20 mins drive; Malaga in 48 mins; 1hr 10 mins drive to Granada. Sheltered by the Sierra de Almijara, Nerja was once a humble fishing village but today it’s a charming and upmarket refuge from the heaving Costa del Sol. 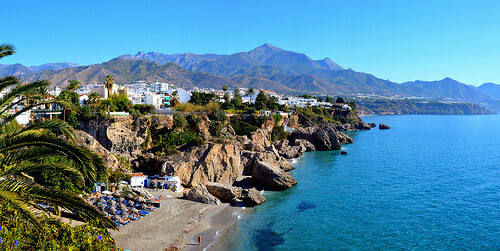 Pop into the Parador in Nerja, which was built in the 1960s on a cliff’s edge – you’ll love the location and sea-views. Must-sees here include the cobble-stoned old quarter, the pre-historic caves (which are a series of huge caverns stretching for almost 5km and home to the world’s largest stalagmite), the sandy Burriana, Calahonda & Carabeillo Beaches – and the Balcon de Europa viewing point. We’ve include Nerja’s Parador in our Guide to the 12 Most Impressive Paradores in Spain. Distance: 1hr 10 to Granada; 57 mins to Malaga. 320 days of sunshine falls on this town which dates back to 713 when it was first occupied by Moors. 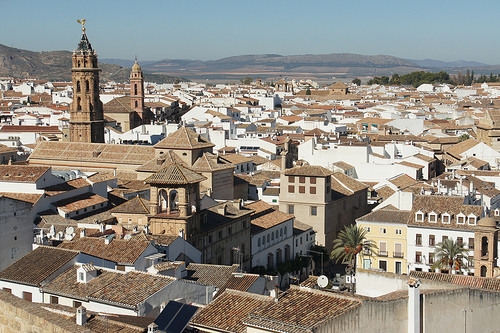 First port of call is the 10th century alcazar – from the towers you can really appreciate its prominence out over the whitewashed houses with winding narrow streets. Another great vantage point is the Mirador del Albaycin which looks out over the River Tagus. Explore the neighbourhoods of the old quarter, Brocal and the Albaycin before going down below to the old town and the ‘El Peñon’ (The Rock) which divides two of Salobreña’s five beaches. Have something to eat at the chiringuitos and read up on the importance of this locality during Granada’s glorious past. Distance: 1 hr drive to Malaga; 40 mins to Nerja; 50 mins drive to Granada. We finish up in Montefrio – perched at 834m high – in the Sierra de la Parapanda. Named by National Geographic as one of the top 10 towns with the best views in the world in 2015, you won’t be disappointed with what you find. Must-sees include the two very distinctive churches – especially the rounded Iglesia de la Encarnación – which seems to mimic the curves of the nearby olive groves perfectly. Just outside Montefrio, you’ll find the Penas de los Gitanos – where over a hundred megalithic tombs and settlements have been excavated – an extraordinary Neolithic archaeological site. Distance: 55 mins drive to Granada; 1hr 30 to Malaga; 2hrs 40 mins to Seville; 2 hrs drive to Cordoba. Interested in visiting more white washed villages of Andalusia? 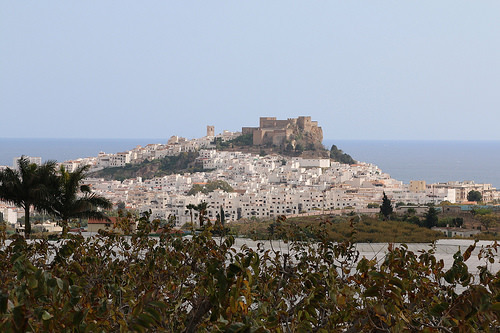 We can also include the very picturesque Vejer de la Frontera, Medina Sidonia, Zahara de la Sierra & Benaocaz – in the province of Cadiz and Alhama de Granada – in the province of Granada. Posted in Andalucia, Getting Around and tagged Antequera, Arcos de la Frontera, Cadiz, Casares, Frigiliana, Granada, Grazalema, Malaga, Montefrio, Nerja, Ronda, Salobreña, Setenil de las Bodegas, white washed towns, white washed villages.